The non profit FSA Performing Arts Program at The Ethical Community Charter School in Jersey City, NJ (TECCS) has a mission to provide performing arts related experiences and opportunities to all interested students after school no matter their family economics. The school does incredible work with children, tweens and teens in all areas of the arts at no cost to them. 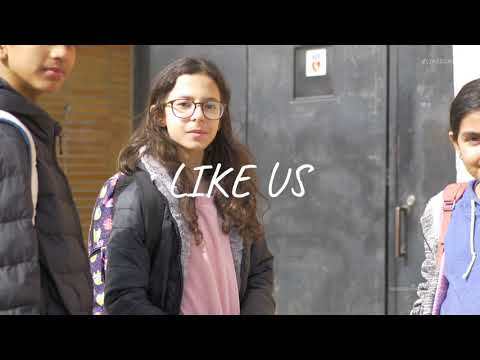 A project of important note is the development of a live action short film titled LIKE US. It is a film for kids, by kids. The screenplay was written by ten students in grades 6-8 over a period of 10 weeks. During some very honest and courageous writing sessions students shared painful truths about bullying that have become very important to the story. During the writing sessions one student shared he was bullied so badly he left his previous school for a fresh start at TECCS. LIKE US, can be seen this September and shows how a group of five students overcome the intimidation and intolerable cruelty by some of their peers. The director is Professional Educator and Television host Kris Van Nest, also Executive Producer of the online media network THISLEARNING®. Assistant Director, Ann E. Wallace, is a published poet and Associate Professor of English at New Jersey City University. The project was produced by Middle schoolers and a growing group of volunteer parents lead by Kim Correro. The Shooting Star Youth Challenge is coming to town, and Cory, Fatin, Lana, Astrid, and Trevor have each been unable to find a team. In a chance meeting in the school office, the Principal asks the group of outcasts—rejected for their gender identity, disability, and personalities—to band together for the competition. Some of the students are not too happy to be forced onto a team of kids that no one else wants, and, believing the terrible things that other kids say about them, they are sure they will lose. They soon learn, however, that each one has a special talent and that the C Flats, as they have decided to call themselves, are a real contender. But as the big day approaches, the team members are shaken by comments made online and in person about them. Together they rebuild their confidence and are ready to compete. However, they soon learn that Lana has been facing a much larger challenge than shooting a basket or nailing a standup comedy routine, when, in a moment of desperation, she confides that she is homeless. Faced with a difficult dilemma, the team must decide where to put its efforts, on making it to States or on helping their friend against her wishes. When the group steps up to help their new friend, serendipitously aided by a group of stagehands who spread the news about Lana online, we see that what makes these kids winners are not the skills they bring to Shooting Star but the size of their hearts. Hidden Valley Elementary School in Savage, MN, has a diverse student population that represents 20 languages. Art teacher Sara Merkel and school social worker Kristen Reichert thought it was important for their students to hear positive messages about kindness, acceptance, and inclusion within the school. They thought of a giant peace dove and chose 20 student leaders, called “student ambassadors,” to cut out 550 paper feathers and hand them out to individual students to color. Those students, and the school’s faculty and staff, did not know what the purpose would be for the paper feathers project. Then, one day, those 550 feathers became a giant display near the school’s entrance and office. Parents, staff, and students from the entire school were surprised and in awe of the beautiful artwork and kind message. Some of these ideas were inspired by Kristen, who attended PACER’s symposium and learned more about educational resources for bullying prevention. This art project is not the only activity aimed at helping students feel safe at school. Teachers, staff, and leaders throughout the school district have taken training to help participants become more culturally aware and sensitive to students’ needs. One outcome in Sara Merkel’s classroom is that she works to include a variety of cultures in her classes. For example, she recently included a Somali folk tale called “The Lion’s Share” as part of the classroom activities. By creating culturally diverse activities in class, students see that teachers are kind, accepting, and supportive people. Grande Innovation Academy, in Casa Grande, AZ, made this video in response to the 'Rocking Kindness' theme they are celebrating during October's National Bullying Prevention Month. The 5th graders, with their science and math teacher, Mr. Reginald Parulan, wanted to share the important message of speaking up against bullying. Why do we need to talk about bullying? What can you do to help someone (and be safe doing it) who is experiencing bullying? What can you do to help prevent or stop bullying at your school, online or in the community? Mr. Parulan shared, "Let's all share the same goal of creating communities that are united in kindness, acceptance and inclusion." When faced with a persistent bullying problem at Burton Tech High School, the student, faculty, and administration decided to do something big: they devoted a whole class period for an entire school year, from August until June, to bullying prevention. The whole endeavor started when two 10th graders went to a teacher with the idea of doing something about the bullying problem that had impacted them both personally. That teacher, Allison Levine, helped them plan for a specialized “advisory” that would be devoted to reducing the amount of bullying in their school and supporting those who were being bullied. Ms. Levine went to Principal Rogelio Sanchez with a plan to have the advisory and plan activities throughout the year for the student body. Starting with exercises and dialogue about their school culture and the bullying that was happening, they brainstormed how they could involve all students in becoming more aware of solutions to bullying they might be experiencing. After naming themselves the “Mentors and Protectors” (MAPS) they planned a large celebration for Unity Day in October that involved the school community, Congresswoman Maxine Waters, representatives from the military, trustees of Burton Tech, and parents. There was a poetry slam, speeches, and booths with games, crafts, and other activities. After that was over they began planning for what they called a “Bully Bootcamp,” where the MAPS students would teach and lead activities with the students from the rest of the school, one advisory after another until every student had participated. When that was completed, again with the support of Ms. Levine and Principal Sanchez, they began to write lessons for the incoming freshman orientation happening Summer 2017. For their efforts, the Los Angeles Youth Advisory Board of PACER’s National Bullying Prevention Center voted to give MAPS a “Faces of Change” award and the school gave them their medals and certificates at an assembly attended by the school community and local officials. What’s next for this amazing group? Doing it all over again in the next school year! The Mentors and Protectors of Burton Tech are creating a community of kindness, acceptance, and inclusion a year at a time. Students at Central High School in LaCrosse, Wisc., celebrated Unity Day on Oct. 19, 2016, by installing a 1,000-piece Unity Origami Peace Cranes Sculpture. This collaborative project was developed by members of the Art Club, led by teacher Lori Aschenbrener, and the Culture Club, Feminist Club, GSA-Gay-Straight Alliance, Chinese Club, and several non-club member students. They contributed to the school’s collection of 1,000 origami peace cranes as a symbol of unity in diversity and a community of compassion. A special thank-you to the students who dedicated seven and a half hours of time to string and hang the cranes, and to all of the students and staff who contributed to the effort! Students and teachers shared that the project was great for the school community and that the creation of the origami cranes spread from student to student. The project was inspired by the story of Sadako Sasaki, who lived in Hiroshima, Japan, during World War II. Before her death, she was inspired by the Japanese legend that if one folds 1,000 origami paper cranes, one would have their heart’s desire come true. Though Sadako died, the memory of her lives — her character and name live. Her story has been translated into many languages and students around the world read about her. She has become an inspiration to many whose efforts support peace and unity; that one’s effort does not go unnoticed. During the program, students are educated on the types of bullying and the effects of bullying, and they become motivated to be upstanders rather than bystanders. Student engagement is high because the presentations are given by peers, and the videos shown are of Lincoln High students talking about their own experiences with bullying and personal advice on how to overcome it. The presentation also includes NCT, which stands for “Name It. Claim It. Tame It.” Scenarios accompany class discussion, and the students sign a “Be a Hero” pledge that says: “I am willing to stop bullying at Lincoln by saying something when I see it and reporting it when I need to.” The signed pledges are placed around the school as visual demonstrations of Lincoln’s ongoing commitment to motivating others to be an upstander when it comes to bullying, a person who recognizes that something is wrong and acts to make it right. We thank Lincoln High School for being a leader in bullying prevention! Ms. Dermer’s 5th grade class at Morikami Park Elementary School in Delray Beach, FL, was thinking about peer relationships and bullying. As part of their International Baccalaureate Program they are required to complete a yearlong study on a topic of their choice; the class chose bullying and social pressures. The students wrote to PACER’s National Bullying Prevention Center to help answer their questions regarding peer pressure, bullying at school, and how social media plays a part. The class has been busy all year long: they created a website, sponsored Unity Day, read the book One to all kindergarten students and did an activity called the "Wrinkled Heart," and held a “No-Uniform Day” fundraiser. As part of the “No-Uniform Day,” students were allowed to pay $2 to dress casually at school. At the conclusion of this project, Ms. Dermer’s class decided to donate the money raised to PACER’s National Bullying Prevention Center! Students at Newton-Lee Elementary School took a unique approach to bullying prevention by sharing their questions, ideas, and advice about bullying on Twitter. This Twitter Chat encouraged students to support one another as they work to make their school a more accepting and inclusive environment. Check out what the NLE Explorers have to say! On October 21, 2015, Sequoia Charter School's students and staff members donned their brightly colored orange attire to send a united message of hope, support, and unity against bullying on Unity Day. Sequoia joined schools and communities across the country to support the theme, "Together against bullying - united for kindness, acceptance, and inclusion," as students and staff participated in events designed to educate, inspire, and involve students to prevent bullying and help create a positive and safe school environment. The day began with a presentation from the Los Angeles County Sheriff's Department Stop Hate and Respect Everyone Tolerance (SHARE) program. Deputy Chatman spoke to an attentive and engaged audience of students about prejudice, respect for individual differences, and tolerance of others. Students actively discussed their role in promoting harmony among individuals from diverse backgrounds in an effort to combat hate crimes and encourage positive leadership roles among campus youth. “The Unity Day effort in Belle Fourche, SD was led by our bus drivers. In addition many community members supported the program by donating time and money. Belle Fourche High School National Honor Society students taught Unity Day lessons to elementary students. Teachers, paraprofessionals, office support staff, and janitors were very supportive of Unity Day in a wide variety of ways including scheduling, making sure they all wore orange, and other special efforts. This whole-hearted support for Unity Day made it a day to remember for our students. Spokane Public Schools are together against bullying – united for kindness, acceptance and inclusion! 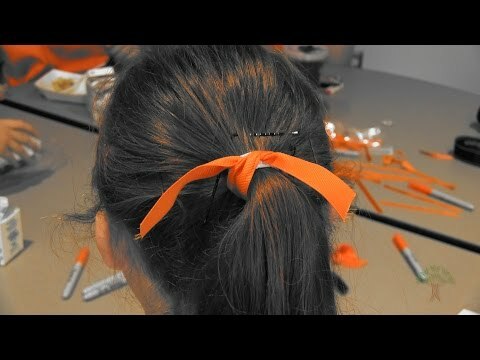 This short video shows how Spokane schools went ORANGE for Unity Day! 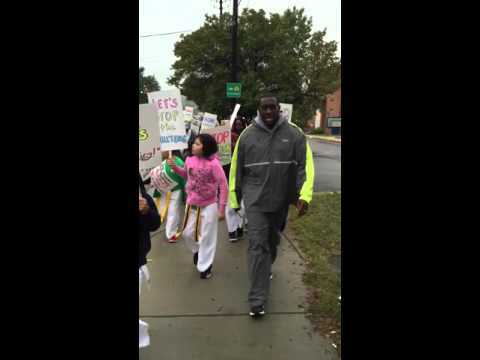 The Tae Kwon Do Ramblers Bullying Busters, a group of martial arts students and their parents and local area participants, led down the sidewalks by Bladensburg Mayor Walter James and accompanied by Bladensburg police, braved the cold, misty rain and marched from the Bladensburg Community Center down a main road leading into Washington, DC, and back to the center. They carried signs and chanted and were greeted by honking shows of support from passing motorists. The day culminated in a stirring rally at the center's gym and made for a very successful first annual Walk and Rally for National Bullying Prevention Month. At the rally, Grandmaster Dr. Clifford L. Thomas' students performed skits to demonstrate ways to address bullying encounters. Maryland Senators Joanne C. Benson and Victor Ramirez; Prince George's County Delegate Jimmy Tarlau; Bladensburg Council Members Trina Brown, Walter Ficklin, and Beverly Hall; local and regional activist Malcolm Augustine; and adult bullying prevention activist Novella Matthews spoke at the rally and made it clear that this community actively cares and acknowledges the work that needs to be done to mitigate bullying behavior. We Lead By Example, Inc./Tae Kwon Do Ramblers Self-Defense Systems is a leader in bullying prevention and supports efforts against bullying throughout the year. Excelsior Middle School leadership teacher Kim Karr co-founded a program called #iCANHELP after being inspired by a student concerned about a fake and damaging Facebook page about a local teacher. Kim realized that students wanted to do something about the bullying and negativity on social media sites, they just needed the right tools to respond. The #iCANHELP message is clear- one person has the power to make a difference and delete negativity online and in his or her life. Excelsior Middle School students have embraced this message and put it into action. They have been instrumental in getting many fake, damaging sites taken down simply by respectfully commenting, reporting the site, and using positive words to combat the negativity. They helped to make sure the victim knows he or she is not alone. EMS students have also changed how they interact online and made a conscious decision to do their part to make social media a more positive place to be. The movement at EMS has inspired hundreds of schools across the nation to also implement #iCANHELP. Students travel to help spread this amazing message through assemblies and leadership trainings. Students enrolled in a therapeutic support program in New York were concerned about bullying, and wanted to do something to prevent it. Along with their teachers, they came up with the idea of creating a video that would share their stories and empower others. The theme of the video is “Tell Me” – as in tell a teacher, parent, administrator, or coach when you are being bullied or witness bullying. 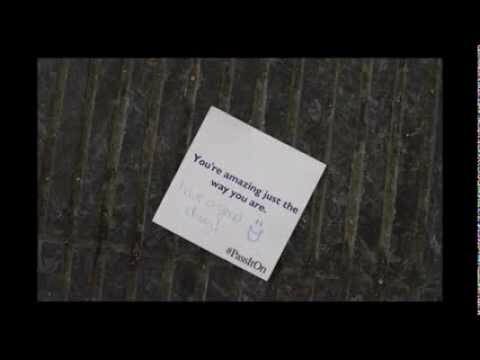 The creators of the video want all students to feel safe and supported in their school, and this video lets them know that they are not alone. When students at Canadore College and Nipissing University in Canada learned about the high percentage of students who are bullied every year, they decided that they needed to take action. They wanted to spread positivity, kindness, and tolerance throughout their school. So they created 6,000 sticky notes for their classmates to take, stick, share, and give. All day, people stumbled upon these notes all across campus and by the end of the day, the whole school felt more supportive. Watch this video to see the transformation for yourself. At Wako International High School in Saitama, Japan, 240 students recently completed a project to examine what they identified as the most pressing social issues facing Japanese youth today. One of these issues was bullying, and the students researched the issue, interviewed experts, and created websites to promote awareness and education. Their teachers, Die Hu, Alana Schramm, and Rebecca Quin designed the project after reading about a student in South Japan who committed suicide after being severely bullied. She wanted her students to work on their English skills in an interesting and meaningful way and to engage with an issue that mattered to them. Die Hu writes, “The project name "Be the change" aims to empower students to be the ones who initiate impact and influences in their environments. And by creating the websites, they ARE being the change by raising awareness of the issues. Which was why it was important for the students to see that real organizations in the real world are supporting their work.” Many teachers contributed to this project, including Mr. Takishima, Mr. Mizoe, Ms. Shinto, Ms. Kinoshita, Mr. Asami, Ms. Koshino, and Ms. Kokubun. Before completing the project, many students said that they had never really thought about the seriousness of bullying. But this project gave them the opportunity to learn more about the issue and to develop empathy for the students who bully others as well as the targets. One student wrote, "I have been bullied when I was an elementary school student. So I think I know feeling of the people who are bullied. Bullying is very painful, and gives us loneliness. People that are bullied are looking for help." Thank you to the Wako International High School for sharing your project with us. Bullying is an important issue around the world, and we appreciate the opportunity to engage with champions across the globe. You can see the websites created by students here. 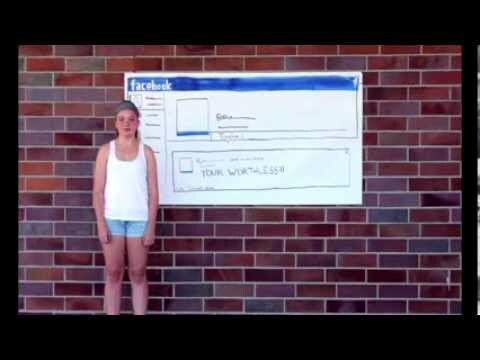 As part of their annual Harmony Day, students of Central Okanagan School District in British Columbia, Canada, created a video to remind their community to be mindful of the effect their actions have on others. The video calls on viewers to “rewind” racism, bullying, and hate and to “fast forward” acceptance, kindness, and love. Every year, Harmony Day encourages the community of Central Okanaga to celebrate their culturally diverse society and renew their commitment to mutual respect and acceptance. Find out more about Harmony Day here: http://www.harmonyday.ca/. The Fletcher School in Charlotte, NC, celebrated Unity Day for the first time this year! Lessons on bullying have been a standard part of the social skills curriculum offered by the K-5 school counselor, but students, teachers and administrators were encouraged to wear orange in honor of Unity Day and bracelets were distributed for all to wear. The message was “Stand up to bullying!” Emphasis was placed on standing up to bullying rather than standing by and doing nothing. Students at Cotaco School were so passionate about preventing bullying in their schools that they decided to survey their classmates about the state of bullying at their school. But their commitment didn’t end there. Students in the Talented and Gifted program got the chance to contribute to a song performed by country singer Jordan Allena about bullying called “It Ain’t Cool to be Cruel.” And they were rewarded for their efforts by hosting Jordan Allena for a full-blown concert at their school! Once the students heard their song on the radio they were passionate about meeting Jordan Allena and having her host a school-wide concert to kick off the anti-bullying campaign. Seth Sullivan with Sullivan’s Productions and WZYP’s Mojo turned the school into a smoked filled, lighting spectacular event to showcase the debut of the song, “It Ain’t Cool to be Cruel.” Students sang the lyrics and danced to the jamming country sound as the music video was shot. Cotaco School students had the opportunity to share their message on a national platform in hopes that their words may reach one person in need and make a difference. We have had the pleasure of hosting Jordan at all of our Morgan County Schools as students get on board to stamp out bullying. The TAG students believe that together they can make a difference…it is their passion! I took to this song because I have been bullied my entire life - mostly because I was always running against the grain - so to speak :) People are so cruel and sometimes without even realizing it! Those words really hit home to me - it's truly NOT cool to be cruel. It's actually small and lazy; it's harder to think about someone else first and what our actions can do to others...a challenge I want people to think about. Bullies are and will be in our lives always, but we can encourage a different way to think about life and others and a different way of reacting to them and their behavior. We should celebrate our differences and our uniqueness! Queen Anne's County Public Schools hosted its inaugural Unity Day event on Wednesday, Oct. 9. During the day Ravens cheerleaders, super fans and Looney Tunes Characters visited each school to promote bullying prevention. At the start of the school day every student and school employee was given a "Bullying stops with me" T-shirt to help spread the message – about 10,000 shirts! The goal was to have all school employees demonstrate their commitment to bullying prevention to their students. The purchase of these shirts was made possible by the generous support of parents, community members and local businesses. Linda Austin, community member and owner of Rita's, was the force behind providing over 10,000 t-shirts for the students and staff of Queen Anne's County. She and her co-chair for the event Stephanie Jarrel from the Queen Anne's County Sheriff's office worked tirelessly to make the event successful. Also during the day each elementary school revealed a Friendship Bench, a bench for those to sit on if they ever feel left out. After the students get into their new shirts, students from each school will be taken out to fields on school property and spell out “no bullying.” Visitors to county schools included Baltimore Ravens cheerleaders, Captain Dee-Fense, The Oriole Bird and various Looney Tunes characters from Six Flags. The efforts of Queen Anne’s County aren’t limited to October 9th. District and school administrators have developed a plan to extend the Olweus bullying prevention program from the few schools it’s in now to every school in the county by 2014. Supervisor of Student Services Brad Engel also reached out to community members to create a committee to work in conjunction with the schools to prevent bullying. In 2012, Shawna Hixon and Lana Barros from Citrus Grove Elementary in Palm City, Florida led an innovative program, “iSTAND”, which they designed to creatively engage students to take action against bullying. In an interview with Shawna, she provides information about the origin of the initiative, what it took to be successful, and the resources for starting an iSTAND group at your school. Shawna shared that in her research she discovered two elements that seemed critical for success. The first was about funding, like most schools, hers had minimal budget for new activities, so it needed to be something that required minimal resources and financial commitment. The second, was based on how to best engage students on the issue, her research showed that students were more likely listen to and follow peers rather than adults. With those two things in mind, she decided on an approach that was student oriented with strong, influential peers and hands on ideas made from scratch.